Comfortably plush and value-priced, this mattress features a Plush Euro Top for softer comfort at the surface. Inside this mattress, two inches of SealyFoam and a layer of Sealy's OrthoZone II provide valuable comfort to ensure you reach rest faster. 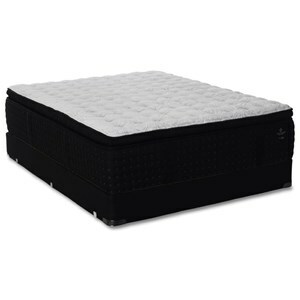 The PostureTech Innerspring coils support your body while you sleep, and enhance the durability of the bed. Box spring not included. The Sealy Brand Level I King Plush Euro Top Mattress and Foundation by Sealy at Beck's Furniture in the Sacramento, Rancho Cordova, Roseville, California area. Product availability may vary. Contact us for the most current availability on this product. Coils and Support PostureTech Innerspring features heavy gauge coils that provide resilient support and durability. The Sealy Brand Level I collection is a great option if you are looking for Mattresses in the Sacramento, Rancho Cordova, Roseville, California area. Browse other items in the Sealy Brand Level I collection from Beck's Furniture in the Sacramento, Rancho Cordova, Roseville, California area.